This is a free pattern. A great way to find out what Genevive’s patterns are like. All patterns are 6 to 7 pages long in a PDF file. Illustrated step by step pattern tutorial. Includes 2 different headband patterns. One is ridged with picot trim and ties. The other is a wider headband in a lacy pattern with a button closure. Pattern fits average female head size with instructions on how to make smaller or larger. Written in American English crochet terms with conversion chart for British English crochet terms. Great Deal! 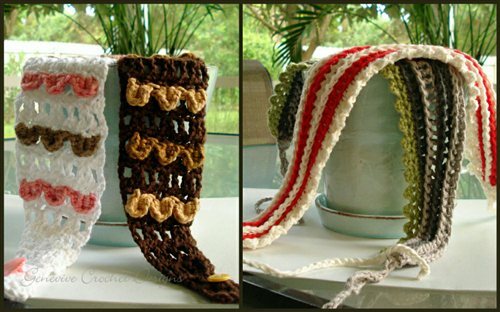 Buy 3 crochet patterns and get a $2 discount at checkout. NOTE I don’t mind if you sell the finished product, but please contact me with the address of where you plan on selling them. No fee is charged. I keep a list of shops who sell the finished items for people who ask for the finished items. I also request you to please credit Genevive at Ravelry for the pattern on your listing page.